When Osama bin Laden was taken out, you may have breathed a sigh of relief. Many thought the threat of terrorism would diminish. Then came ISIS. What does it mean for you, as a Christian? For the last ten years, I have consulted a ministry called POBLO: People of the Book Ministries International (www.poblo.org). Many of those at POBLO originally came from the Muslim world. As Christians, their ministry is to help North American Christians and churches reach out to their Muslim neighbors. Today many of the immigrants coming to this country are from a Muslim country. That can frighten you, or you can see it as an opportunity to share your faith. It is easier to speak about your faith to a Muslim neighbor than it is to be a missionary in a Muslim country. I know, our son is a missionary in Malaysia. ISIS extremists are radical Muslims. By contrast, most Muslims are not. Many of those who have settled in North America are nominal Muslims. They do not practice their Muslim faith. They are not aware of the radical teachings of Islam. In my work with POBLO, I have developed a friendship with “John.” (I won’t use his real name, for safety.) He is a former persecutor of Christians in Iraq, under Saddam Hussein. “John” decided to read the Christian Bible so he could, more accurately, argue against Christians. “John” says, “I found the God of love in the Bible, and I converted to Christianity.” “John” is now in the U.S. as a missionary to Muslims. “John” says, “ISIS shows other Muslims the dark side of their religion.” He claims, from the Christian perspective, ISIS has given us a golden opportunity. With so many Muslims uneasy about radical behavior, this is a great time to express the Christian faith. Many Christians I have met look at the growing number of Middle Eastern immigrants as a serious problem. Some are understandably afraid. However, “John” says this is a great outreach opportunity. When you meet someone with a background in Islam, don’t be afraid. Chances are, they are not the “bad guys.” It is quite likely they do not practice their faith – they just inherited it. Immigrants who are new to our country have some fears of their own. It is hard to be an immigrant to another country. You have to remember, for those who come here from a predominantly Muslim country, our culture is very different. Be friendly. Learn all you can about those who grew up in a Muslim culture. You can get resources from my friends at POBLO. They help Christians reach out to their new neighbors. There is one custom that is international. 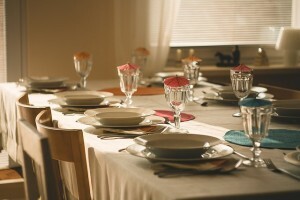 It is a strategy available to anyone: opening your home and inviting someone to dinner. Hospitality is a high value in many cultures, especially in the Middle East. As a Christian, you are very likely to have the opportunity to introduce your new friends to your friend, Jesus. The mission field is coming to us!